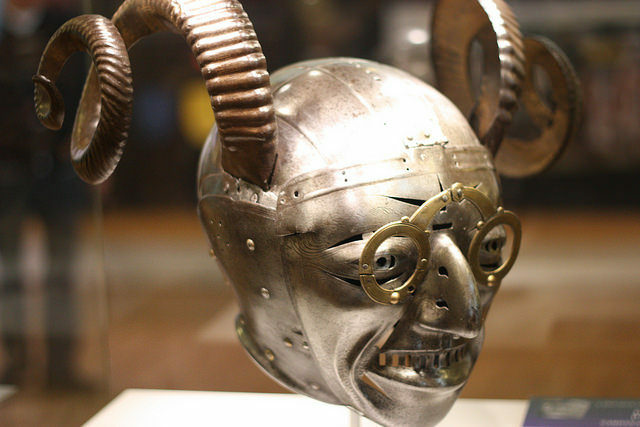 With its spiraling horns, bizarre spectacles, and large nose, the Horned Helmet of King Henry VIII features a beautifully crafted face. It is finely detailed with crow’s feet etched around the eyes, realistically engraved stubble and eyebrows, a sniveling drip of snot hanging from the nose, and a dreadful set of tombstone teeth. The helmet can be seen on display at the Royal Armouries museum in Leeds, England. 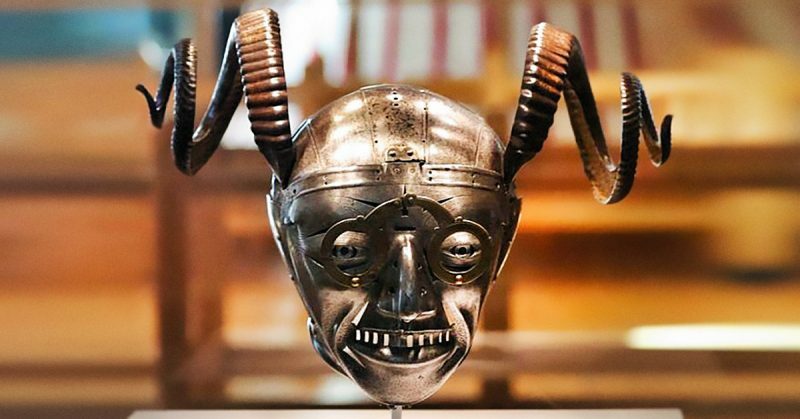 Due to its strangeness, it was thought for a long time that the Horned Helmet belonged to Henry’s favorite court jester, Will Sommers — who was said to have been the only man that could make the old bloated king smile in his later years. However, it later came to light that the armor was, indeed, owned by the King. 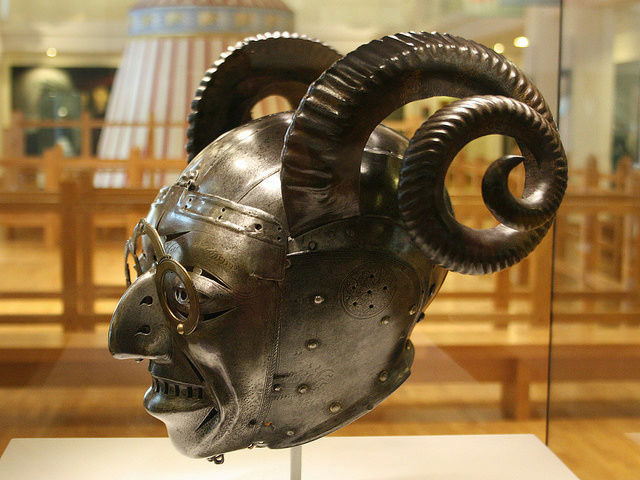 King Henry VIII received this horned helmet as a gift from the Holy Roman Emperor Maximillan I. There is very limited data about the helmet. The pair of ram’s horns, beautifully modeled in sheet iron, are particularly perplexing “as this was the sign for a cuckold,” or possibly the Devil. They leave historians scratching their heads as to why Henry VIII would not only accept such a piece as a gift but also be seen parading in it. “Basically it is a bit of enigma with scholarly debate still raging!” concluded Senior. As for the Steampunk-style glasses, these may have been added at the behest of Henry himself after the armor came into his possession. It is known from his collection of spectacles that the king was near-sighted — perhaps he found adding a set to his helm an amusing self-parody. Originally, the helmet was created by silver-gilt panels overlaid with a rich, velvet cloth. It is the only surviving part of an entire suit of armor created by Konrad Seusenhofer, one of the most outstanding arms manufacturers in Medieval Europe. 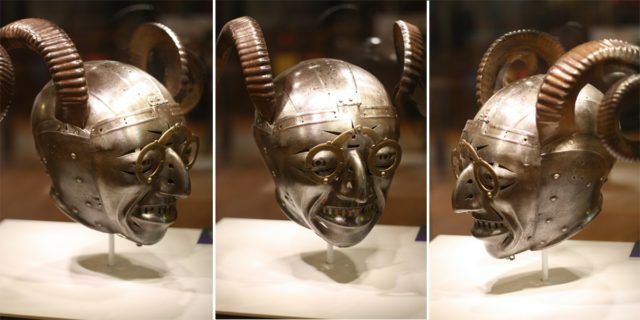 The Horned Helmet topped off an ensemble that was gifted to Henry VIII in 1514 by the Holy Roman Emperor Maximilian I. The rest was most likely destroyed and sold as scrap during the English Civil War. The Horned Helmet is technically called an armet because it protects the skull and face. This type of helmet was developed during the 15th century and was extensively used in England, France, Italy, Spain, and the Low Countries. Their use was essentially restricted to the fully armored man-at-arms. Henry’s armet was among the very first examples to completely enclose the head while still being compact and light enough to allow dynamic motion. Curator of Historic Arms at the Royal Armouries, Karen Watts, explains in a short YouTube film that the wearer can “breathe through the nostrils, see through the eyes, and speak through the mouth,” unique features that mark this as a headpiece fit for a king. 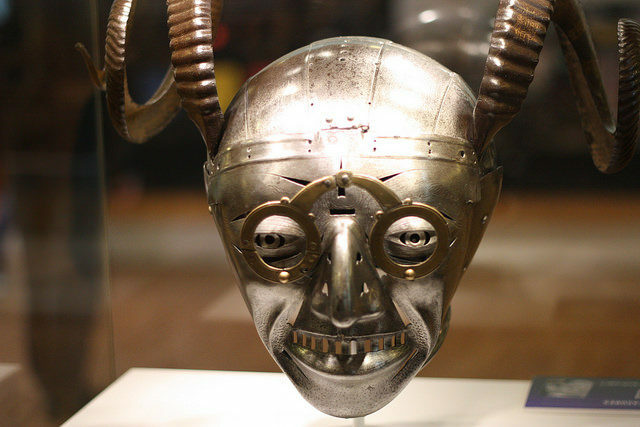 Henry’s elaborate armor was made for use in pageants rather than for combat, which is a shame because even though it may have looked absurd in battle, that ugly face on the helmet would have unnerved any enemy soldier. 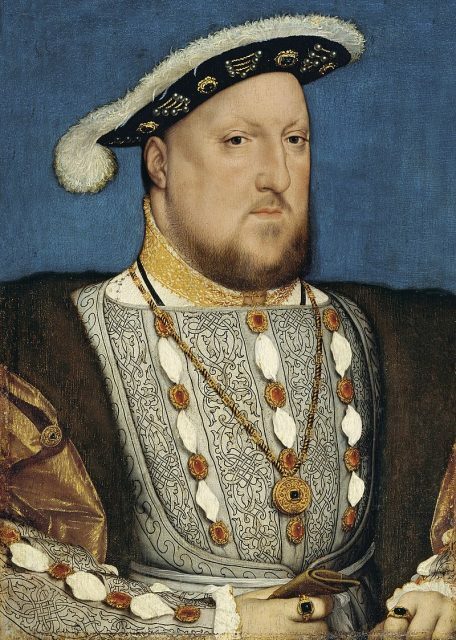 Henry VIII might have worn it at sumptuous events such as the parades that accompanied tournaments. The full armor from which the Horned Helmet originates was one of three of similar design made by Seusenhofer, but only the armor given to Maximilian’s grandson, the future Emperor Charles V, survives intact in Vienna.